Halloween turned out to be quite a treat for the kids at the St. Nicholas Catholic Junior High School soccer academy. The Edmonton school's most famous export — Canadian soccer star Alphonso Davies — dropped in to hang out. Halloween turned out to be quite a treat for the kids at the St. Nicholas Catholic Junior High School soccer academy in northeast Edmonton. Out of the blue on Wednesday morning, the Beverly school's most famous export — Canadian soccer star Alphonso Davies — dropped in to hang out. Soccer academy director Marco Bossio got a call from the 17-year-old earlier this week, saying he was going to be back in Edmonton and wanted to come by for a visit to his old stomping grounds. "It was an absolutely a crazy day, for sure," said Bossio, who first came into contact with Davies when he was a 12-year-old Grade 7 student in the school's soccer academy. "When Alphonso walked in the hallways and the kids saw him they were star-struck, they would go up to him and ask for his autograph and want to take pictures. It was great the kids got to see him as not just a player on TV, they got to see him as an actual person." It wasn't that long ago that Davies was roaming the same halls as many of the kids at the school. He attended the soccer academy at St. Nicholas for two years, leaving when he turned 14. Davies signed to his first professional contract in 2015 with the Vancouver Whitecaps FC. By 2016 he was playing on the professional team and scoring goals. Bossio, his former coach, said he knew Davies was special when he first laid eyes on him. "I knew that this boy was destined for greatness," Bossio said. "And at the age of 11, to be able to realize that says a lot. This kid was very special." And the soccer world realized that quickly, too. During the 2016 season with Vancouver, Davies played in eight MLS games, four Canadian Championship games, and three games in the CONCACAF Champions League. His international exposure garnered interest from European clubs including Manchester United, Chelsea, and Liverpool. 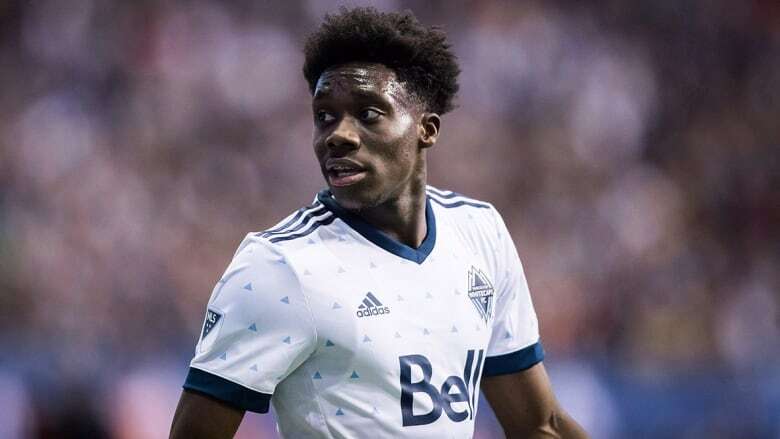 Eventually on July 25 of this year, the Whitecaps club announced it had signed a multi-million dollar transfer of Davies to FC Bayern Munich in Germany's Bundesliga. Last weekend, in front of family and friends, Davies played his farewell game for Vancouver. The young star scored twice with a pair of highlight reel-worthy goals in his team's 2-1 home win over the Portland Timbers. Bossio was in the stands with his own family, watching what he called a moment he'll never forget. "It was an emotional night, a memorable evening," he said. "I felt the need to be there because I've seen him since he was a young little boy to becoming a young man. It was his final game in North America so I thought I'd go and bring my wife and go and check it out. It was a great experience, because he put on a show. "He scored a memorable goal in front of his family so that was beautiful." Davies is off the soccer pitch for the next little while, and is planning to celebrate his 18th birthday later on this week with friends and family. Then he's back on the soccer pitch in a couple of weeks with the Canadian men's national team as they head to St. Kitts for a game on November 18. After that game, he's off to join Bayern Munich, where the rising Canadian soccer star will begin the next phase of his professional career in Europe.